I love an election year (exciting! democracy breathing!). And a good cup of coffee (strong and smooth, please, which means no thank you for Starbuck’s unless I’m desperate which does happen from time to time). I’m also partial to a good, long chuckle. And a true classic movie or two (we showed The Natural to our kids the other day – I will never ever get over my crushing crush on Robert Redford, but it’s not my fault because he’s so dreamy and such a cool character – and anyway I forgot that Glenn Close was the long lost love!). Something I don’t do often enough? High fives. Don’t leave me hangin’, okay? I will never … leave you hangin’. I will always return your five. You can count on me. Know what else I love? Crispy crunchy buttery salty gluten free parmesan crackers. If you miss Ritz, you’ve come to the right place, bee-tee-dubs (can I pull that off? don’t answer that). 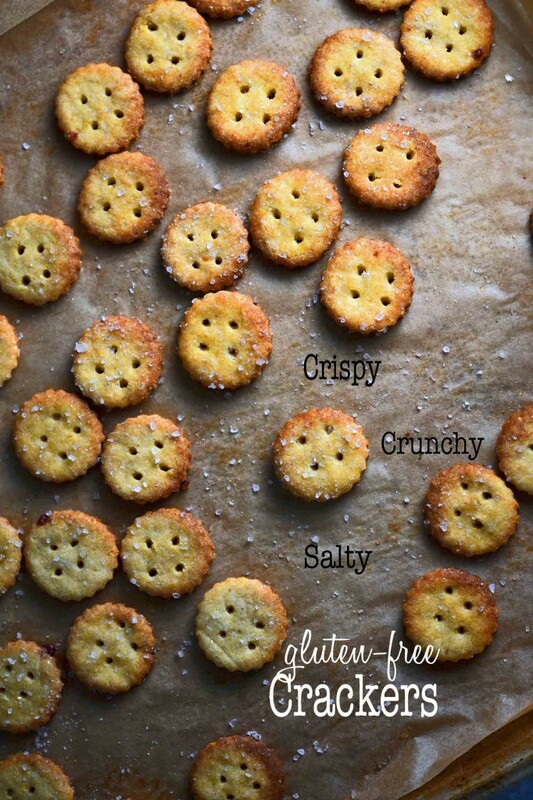 We did gluten-free ritz crackers last summer, and they’re perfect. These are crunchier and a little bit more snacky, on account of their crunchiness. 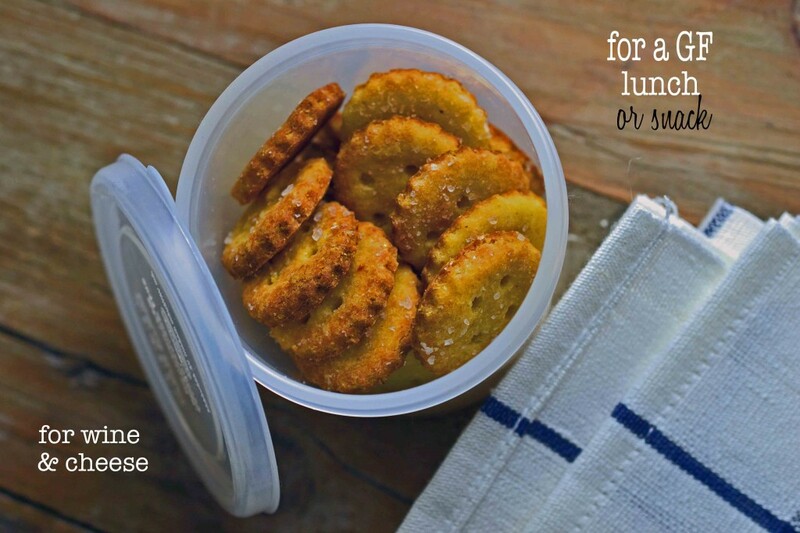 I made them rather small, for my kids’ school lunches since my little one is a slow eater, slow like honey, and seems to eat a bit faster when a snack is made for popping right in your mouth. But you can make them bigger and serve them with wine and cheese. The Parmigiano-Reggiano cheese helps give them true depth of flavor, and the cornmeal gives them that toothsome bite. They have a surprisingly small amount of butter, but the extra melted tablespoon that you brush on top before sprinkling plenty of coarse salt really makes these crackers a true favorite. 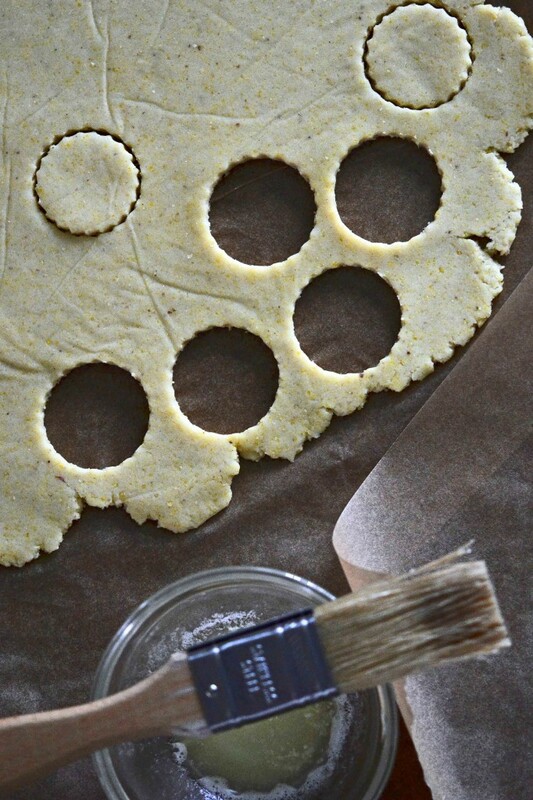 Don’t forget to poke some holes, to help the crackers rise in the oven. It really helps them crisp. And you get those nice, round holes in the dough by poking a toothpick in straight and then moving it around in tiny circles to widen the hole. Once you get the technique down, it goes super fast. And it’s worth the extra few minutes for gluten-free cracker perfection. Preheat your oven to 350° F. Line rimmed baking sheets with unbleached parchment paper and set aside. P.S. If you don’t have your copy of Gluten Free on a Shoestring Bakes Bread yet, won’t you grab one today? There are more cracker recipes, plus recipes for every gluten free bread under the sun—and they taste just like you remember they do with gluten! Which GF flour blend did you use, or do you make your iwn?? These sound amazing! I would love to try to make these, but what is “23g) cultured buttermilk blend (Saco brand – available in most larger supermarkets)”? is it just buttermilk? Looking forward to it, love the site! Made these this afternoon. I was hoping they would be more like Annie’s parm bunnies which were my son’s favorite before having to go GF. So, they are not Annie’s – but they are AWESOME! I took a cheat to see if i could just roll out the dough and pizza cutter it into squares (the little man was loosing patience with me). It worked fine – the center was just more like a cornbread thin and not crispy. I foresee these going onto my weekly – to bake list! Thank you! I have never heard of Annie’s parm bunnies, so I wasn’t seeking to replicate them, I’m afraid. If they weren’t crispy, they either need to be rolled thinner, or cut smaller. Or both. I just made these tonight. My prep time was more in the hour range but I haven’t figured out how to roll everything consistently yet. I was very pleased the way the crackers came out but next time will definetly use the reggiano cheese. Next time I think I might try making and cutting the dough and freezing the uncooked disks so that I can bake only the amount I need, without thinking I ate have a sheet tray. Thanks, and keep up the good work. I stalk the blog checking out the recipes and pictures until I get the courage to try something new. I made these today and they were delicious and unbelievably easy to make. Almost too easy! I cut them in squares with a bench cutter. Thanks for another great recipe! My youngest also just went GF a couple weeks ago. I have been GF for 1.5 yrs. He was sad about missing his ritz crackers which he loved. I am sooo excited to make these while he is at school this week and surprise him! Nicole you never cease to amaze me. I am so excited for you new book. Your name is spoken often in our house…with great thankfulness and awe of your recipes! Thanks again! I see that you say to eat crackers within 2 days. 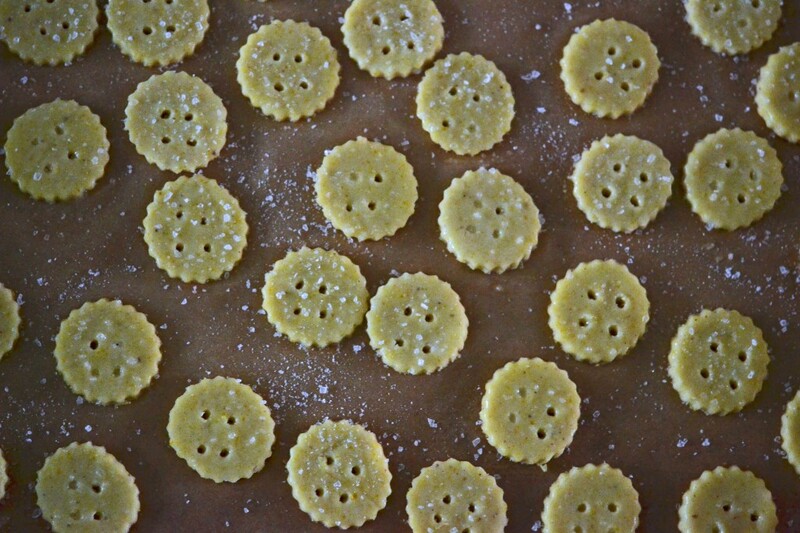 I would like to make a big batch of crackers that would either keep well over a longer period or able to freeze. Any suggestions on a cracker recipe that would work? Gaylyn, no recipe for fresh crackers, without the preservatives of store-bought crackers, will stay crispy for much longer. There isn’t anything in particular about my cracker recipes that makes them more perishable. It’s the lack of preservatives. You can try making a bigger batch and freezing them, and then crisping them in a 200 degree F oven before serving, if you like. Thanks! I will try freezing and crisping up and let you know how it goes. Recently diagnosed, obsessed with baking all of a sudden. But I am in Canada, not sure I can find the Saco product. Does it have to be buttermilk powder? I assume real buttermilk won’t work. Hope you’re kiddos had a good first couple days of school! what is cultured buttermilk blend ? Thanks! Cultured buttermilk is a powdered cultured buttermilk, Gaylyn. You can see some information about it here. As I indicated in the recipe, you can find it in most major supermarkets. Great! I was hoping that is was this. Have in the fridge! Thanks so much for your recipes! Love your first cook book and look forward to the second, which I have on pre-order! Nicole my friend (yeah I said friend- I consider you as such since I check your blog daily- and I know you don’t know my from Adam… but I don’t care- you have SAVED me numerous times with your awesome recipes- so, “friend” you have become)! These looked so good I went and made them this morning… but unfortunately, I’m going to have to make another batch to put in my son’s lunch sack tomorrow- because we ate them already. ALL of them. My waist line may not thank-you, but the rest of my family does! Yummy! Had a request. Would it be possible to put the name of the new recipe you are posting right in the subject line? It makes it easier to file in my gluten free folder, don’t have to wonder what is in each post when I am looking for a recipe. Hi, Ann, I’m not sure I understand what you’re asking. Are you referring to the emails of my posts? If so, my email marketing service does not enable me to customize it like that, I’m afraid. Wish I could! I’m saving this recipe to my files…. Love the crackers! I think I will cut them into squares when I try them. Squares are a great choice, Patty! Less time-consuming, for sure. :) My kids ate all of mine. Wish I had just one right about now.